It is my intention to use the best materials and construction possible. I carefully select the wood for each piece to match customer preferences "calm, wavy, curly, darker, lighter" etc. Although drawer fronts will usually be cut from one board, I can re-saw and bookmatch drawer fronts or tops for approximately +5%. I often customize pieces for clients, a few inches longer, grain matched this way, add a shelf here, etc. Slight additions or changes typically only increase cost by +5%. Simple custom pieces from scratch involve an average $480 design fee. All tops, drawers, legs, cross rails and door rails are solid wood. For drawer bottoms and backs, I use veneer core plywood. I lay up my own premium extra thick selectively harvested book matched curly cherry veneer into door and side panels, but am happy to use 100% solids on request. I occasionally do figured veneer work, inlay, etc. The cherry and walnut I use comes from selectively logged, well managed, local farmers’ woodlots. It is sawn under my supervision so I can match pieces and sometimes rooms all from one tree. I have access to reclaimed and rescued wood from barns, rivers and bogs, as well as certified wood from overseas. For examples of different woods, click here. Mortise and tenon joints are used on cross rails and bed rails. 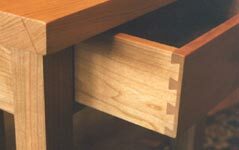 Half blind dovetails are used for drawers. Tops are attached firmly with a floating system to allow for seasonal expansion and contraction. I often add the following design additions, priced here for convenience. Custom spaced dovetails - $120 setup, $15 per drawer. Blum Tandem Slides - $25 pair. Accuride slides - $10 pair. Accuride T.V. Tray - $100 each. Varnish finish - add 6% to each piece. I prefer to hang my drawers on shop made wooden runners. The silky smooth action only improves with time, and the drawers keep their location better. Small drawers run in wooden tracks, larger drawers have a groove down the side with the slide mounted inside the unit. For cedar drawers in my dressers, I inset a more durable cherry slide into the cedar, which runs in a hardwood track in the unit. Metal slides are available for a per drawer cost: Blum Tandem under mount full extension slides are effortless hidden slides adding $25 per drawer, Accuride side mount full extension slides add $10 per drawer. Hinges are solid brass, with 1/16" thick leaves, bright or antique finish (to blend in). Catches are brass bullet catches. Shelf pins are solid brass, threaded for permanent and positive engagement, with a bright brass or dark bronze finish. Adjustable nylon levelling feet ensure that pieces accommodate sloping floors and carpets. The feet are unobtrusive but can be removed and covered with felt pads. Bed hardware is precision German made, hidden mortised, and tightens as weight is applied. Entertainment centre has the best Accuride pocket door hardware, with crossed wire tension for smooth and sure action. The doors self close onto small shop made wooden cam stops. TV tray is serviceable for turning and some extension but for a $100 surcharge a full extension deluxe Accuride tray is available.